The Nordic Thingy:52 is a 40€/50€ device based on the nRF52832 Nordic microcontroller that has, in a ready to use package, several environmental sensors, that can be accessed by low power Bluetooth (BLE). Nordic provides a complete solution that comprises the Thingy:52 firmware already flashed on the device (Source at GitHub) and an very nice Android Nordic Thingy:52 application, with also sources available at GitHub. Anyway I have some of these devices for some months now, for other uses, but I decided to test the ESP32 based boards, since the ESP32 has Bluetooth and theoretically can connect and gather gather data from the Thingy. So this post is about the use of the TTGO ESP32 Lora based boards with an OLED to gather data, show it on the OLED, and send it to The Things Network. Seems simple, right? 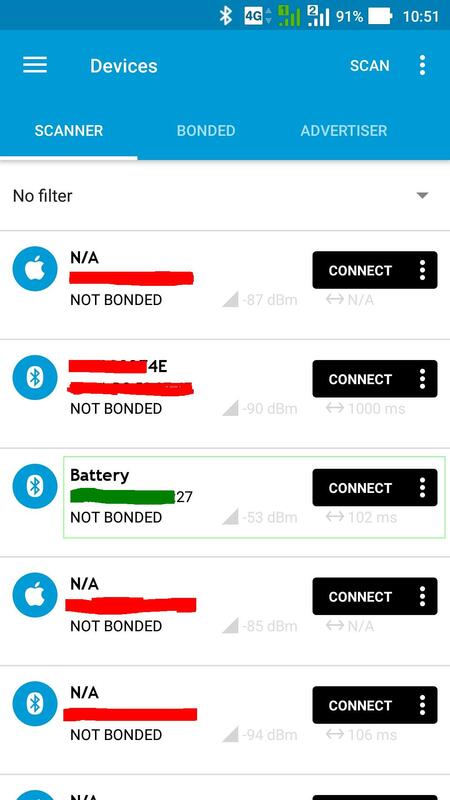 So when a application connects to the Thingy:52 it can be notified when a sensor value changes throught the standard BLE notification mechanisms. The way the Thingy firmware works, this notification happens at a fixed intervals instead of a value change, and that interval, 5 seconds, 10 seconds, be defined by the Android App or programmatically by our application. The application is developed by using the PlatformIO and for using the ESP32 Bluetooth interface, I’ve used the NKolban ESP32 BLE Library that happens to be library 1841 at the Platformio repository. To cut a long story short, as still of today, the ESP32 BLE library doesn’t work correctly with the Thingy:52 notifications. This means that the application subscribes to have notifications, but those never happen. Fortunately someone already hit this problem and solved the issue, but the correction still hasn’t hit the library. 1. Clone the TTGO ESP32 repository from . The repository uses the PlatformIO to build the application. 2. At the root of the repository run the command pio run so that the libraries are downloaded and installed. At this point we need to correct the Arduino ESP32 library to add the patch to the notification issue. * @brief Write data to the BLE Remote Descriptor. * @param [in] data The data to send to the remote descriptor. * @param [in] length The length of the data to send. * @param [in] response True if we expect a response. // Check to see that we are connected. – The ESP32 connects to the Nordic Thingy:52 device. – Current sensor data is shown on the serial terminal. – When notified by the Thingy:52, the ESP32 shows the new data on the OLED screen (WIP – Work in progress). – To keep the application obeying the ISM bands duty cycle, it collects the data, calculates the medium, and sends the data to the Things network each 10 minutes (Also work in progress). The nRF52 based chips are the latest version of the popular Bluetooth chip from Nordic that has an ARM Cortex based processor and Bluetooth communications support. Based on ARM Cortex M4F instead of ARM M0. The following post centralizes the information that I gathered to start using the demo board that I bought based on the nRF52832 chip. This board build is based on a two boards joined together: one daughter board holding the nRf52832 chip, and another, larger board, exposing the pins, JTAG/SWD connector, power regulator, two leds and two switches. As a bonus the main board was designed for something else and so all the pins silk screen are just plain wrong, but at least the power pins and the SWD pins are correctly identified. For mapping out correctly the nRF pins to the out pins we need to see the board schematics vs the daughter board pins. 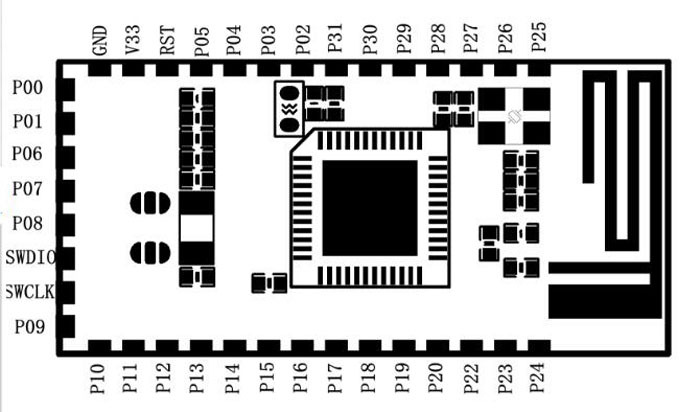 This board schematics are here at this link: NRF52832 Module Test Board V1.0. Checking the schematics vs the daughter board pin out we can see that on the pdf schematics file our nRF chip is located where would/should be a CC2640_RGZ module (!…). For example on that module the DIO0 pin corresponds to P25 pin, the DIO1 pin to P26, and so on. We also can check that by, probably sheer luck, the power pins and SWD pins TCLK-SWCLK and TDIO-SWDIO are just right… and so they just reused the main board to hold the nRF52. Checking out the board and the schematic we can see also that we have a switch on nRF52 pin P04 and two red leds at P30 and P31. The leds can be disconnected by removing the soldering on the nearby solder bridges. The other pins seem free. As a final note, at least the board that I’ve received, comes with the BLE peripheral Nordic UART example loaded as the running firmware. Both ways allow to successfully program the board and debug the running code. To avoid making this a very long post I’ve split it into further posts how to build the tools necessary to program the nRF52 chip. BLENO is a greate NodeJS based library for building applications that communicat with other devices (Smartphones, tables, sensor tags) using Bluetooth Low Energy (BLE). This post is just to quickly document some requirements for successfully use the BLENO library, in my case, on Arch Linux running the latest Plasma (KDE) desktop. 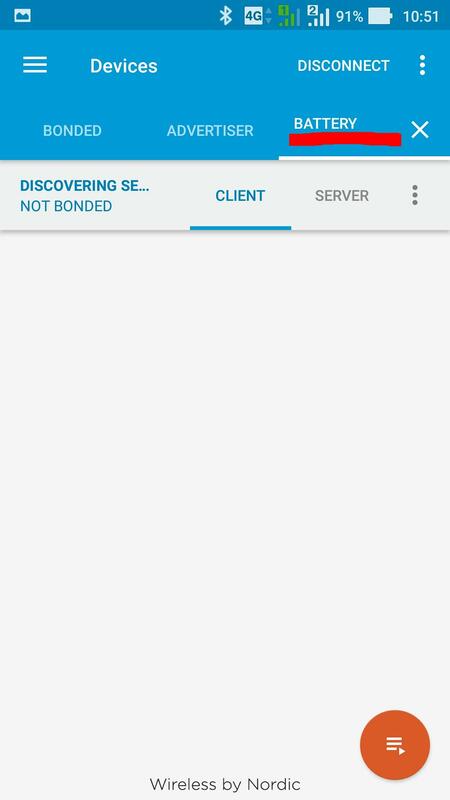 Most the information available on the internet for using and controlling the bluetooth adapter uses the now deprecated tools hcitool, hciconfig and so on. Check here the deprecated list of commands. So why we are having all this work for making sure that the BT adapter is powered on AND the bluetooth stack is stopped (systemctl stop bluetooth). The answer is quite simple. 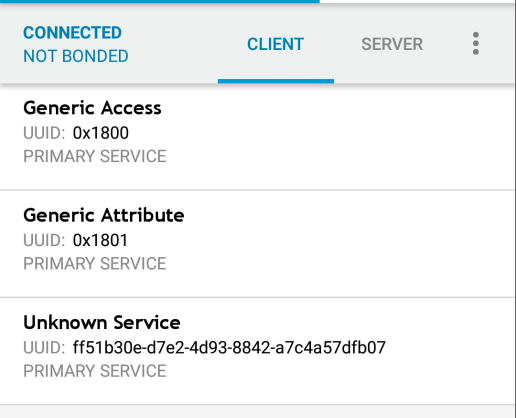 If we don’t do this the BLENO examples will seem to work (they start) but the BLE advertised services are the bluetooth Bluez services and not our code. and it is the same detected by the Android application.